In one of our previous posts [http://wp.me/p300CJ-15] we showed how important the calendar synchonization is in your Inter-Org Exchange migration project when using Quest Migration Manager for Exchange. The Quest approach runs 2 mailboxes for every user (1 in source, 1 in target organization) which enables a long coexistence but also requires a fast running calendar synchronization between those mailboxes for actual Free/Busy information. As less mailboxes per calendar sync agent instance as faster your calendar sync will run. That is a simple truth. But it is not the only one. When we started to design our Quest Mail and Calendar Sync Agent setup in our large scale project, the customer was very generous and spent us 25 virtual machines with 2 processor cores each. 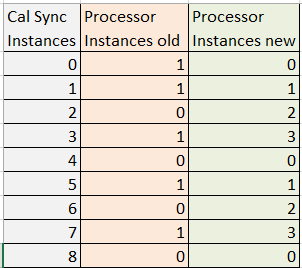 We installed 9 calendar sync agent instances (QMM 8.8) on each of the servers. 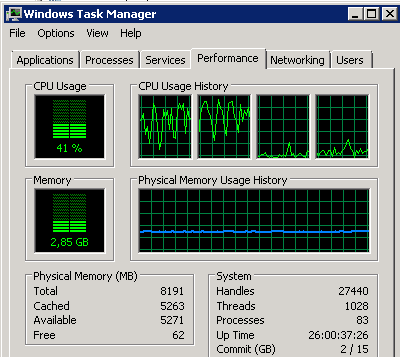 The customer still had some resources left and spent us another 2 cores for each virtual machines. Running this “QMM server farm” we expected to meet and even exceed the customer’s expectation of 20 minutes calendar sync latencies when bringing over a new calendar entry. However, the performance was not like expected. But sometimes things are simpler than they look at first sight. In every Quest mail or calendar sync agent folder you can find an RCmd.ini file. The RCmd.ini file contains the string “ProcessorIndex” which defines the processor instance to be used by the agent. When we parsed the files we recognized the distribution as shown in red column. Only the cores 0 and 1 were defined in the RCmd.ini, but not 2 and 3. With this insight it was a straight-forward task to create a powershell script that parsed through all agent instances on all QMM agent hosts to adjust the ProcessorIndex settings in the RCmd.ini files.